This is a quick teaser video for Maximum Overdrive. iOS game due to hit the iTunes app store December 2014. Maximum Overdrive = Monster Truck mayhem!!! Do you love Monster Trucks? How about Monster Trucks equipped with Guns... BIG GUNS? 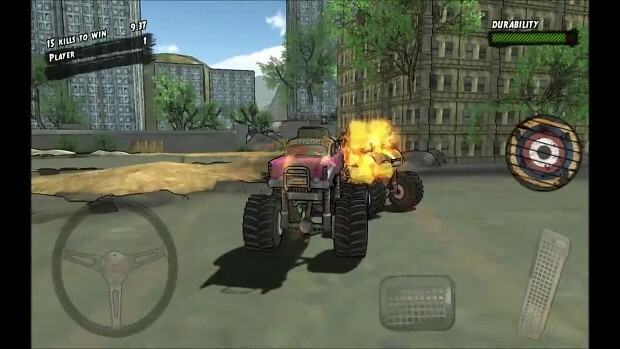 Maximum Overdrive puts you in control of over 15 Insane MONSTER TRUCKS with a huge variety of weapons. Choose from Machine guns, Cannons, Rocket launchers and more as you battle for supremacy in an all out Post Apocalyptic world. - Welcome to the world of Maximum Overdrive. A post-apocalyptic romp through the ravaged "Divided States of America"! - Total Carnage and Destruction await as you fight for survival! - Easy to learn, hard to master - Do you have what it takes? - Unique 3D environments powered by the award-winning Unity Engine send players on-site to one of five spectacular post-apocalyptic locations! - Select multiple control schemes and adjust their sensitivity for maximum control! - Support indie game development and show your love! - Emotional Robots is a self-funded, independent games developer. Whats not to love?